Disney Pixar has released a new short for its upcoming animated film Coco, introducing main character Miguel’s hairless dog, Dante. All he wants is a little snack, but as he learns the hard way, you shouldn’t rob the dead. 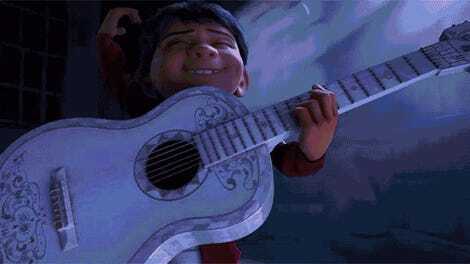 Coco, directed by Lee Unkrich (Toy Story 3) is about a young musician named Miguel (Anthony Gonzalez) who yearns to become a musical icon like his idol, Ernesto de la Cruz (Benjamin Bratt). After he takes Ernesto’s guitar from his grave, he and Dante are transported to the Land of the Dead, where he and trickster god Hector (Gael García Bernal) work together to find out the truth of Miguel’s family history. In Dante’s Lunch, we get our first long look at Dante, a very hungry Xoloitzcuintli who finds the wrong bone to pick. Dante looks to definitely be one of the movie’s cutest additions, even if he slobbers like crazy, and the clip shows off more of Coco’s immaculate design. This might also be our first look at Hector, who’s said to take on the form of a skeletal spirit. Check out the short below. Coco is out November 22.